Reduce time and costs with easier servicing and maintainability! Creating custom solutions for different markets is our expertise. Read how we helped our rail customer reduce costs & improve efficiency in our case study. Our shockproof and weather resistance products are a perfect solution for your needs. Explore one of our many rugged products that offers a mix of high performing technology and robust design for any industrial application. Introducing the DisplayPAC-PCAP, a projected capacitive panel PC. With a sleek design and multi-touch touchscreen, it is a modern solution for your unique industrial computing needs. We are proud to announce the addition of the DisplayPac-N2800-IP65-XT to our product line. It includes an IP65 front bezel and will operate at extreme temperatures. Get industrial solutions for Linux or Windows based applications. Explore the latest technology in flat panel displays. Find an industrial workstation for the harshest conditions. We were among the first to introduce the concept of combining flat panel displays and touchscreens integrated with a ruggedized PC compatible computer system (circa 1990). Since then we have improved on these systems by providing the latest in ruggedized computers, LCD displays, industrial computers and various touchscreen technologies. We also pioneered many of the packaging and mounting techniques that make our products superior for industrial applications. We know monitors are the most interactive part of your system design. 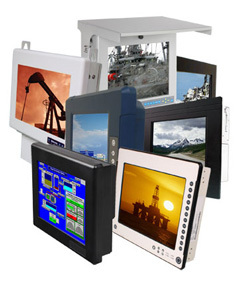 As an industrial flat panel monitor manufacturer, we offer monitors in various sizes and enclosures to fit most any application and which are highly functionable with your computer system. We provide ruggedized computer solutions for a wide variety of end uses. Our products are designed to operate from outdoor extreme heat and cold environments to controlled indoor environments. Our product offering reflects our experience and longevity in the market as we continually offer products that our customers want for all sorts of applications. Computer Dynamics' long-term commitment to its customers is to provide cutting edge products for the lifetime of their projects. With custom enclosures, embedded systems, displays and touchscreens, our Applications and Sales Specialists can help you with any of your custom or semi-custom requirements.